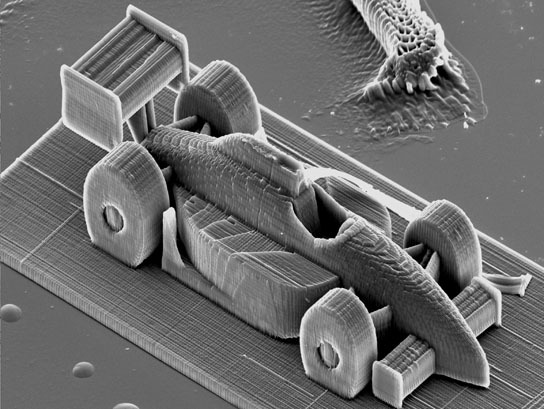 A 285 µm racecar, printed at the Vienna University of Technology. Using “two-photon lithography,” scientists at the Vienna University of Technology developed a high-precision 3D printer that can print five meters in one second. The printer uses a liquid resin that contains molecules that are activated by a laser beam and harden at the precise spots where the laser beam is focused. Researchers all over the world are working on 3D printers today – at universities as well as in industry. “Our competitive edge here at the Vienna University of Technology comes from the fact that we have experts from very different fields, working on different parts of the problem, at one single university”, Jürgen Stampfl emphasizes. In materials science, process engineering or the optimization of light sources, there are experts working together and coming up with mutually stimulating ideas. The Vienna University of Technology is part of the research project “Phocam”, in which new 3D-printing-technologies are being developed in close cooperation with partners from industry. Be the first to comment on "High Resolution 3D Printer Prints 5 Meters per Second"